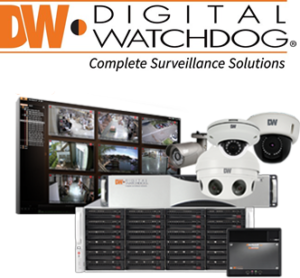 Complete IP megapixel surveillance solutions include single- and multi-sensor MEGApix® cameras and edge recording systems, Blackjack™ NVRs and DW Spectrum™ IPVMS for server, mobile and on-camera control. MEGApix® 2.1MP network cameras provide real-time 1080p High Definition video at 30fps. 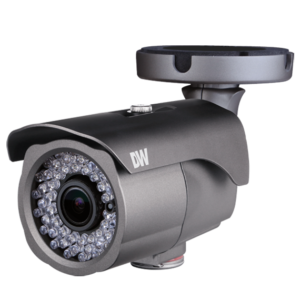 Advanced technologies include 50ft Smart IR™ and true Day/Night for clear images in challenging lighting conditions. A built-in Web-Server and user-friendly interface make these cameras easy to use. Power over Ethernet simplifies installation by providing both power and the network connection through a single cable. These MEGApix® IP cameras deliver crystal-clear images at 5 Megapixel resolution at real-time 30fps. Features include Smart IR™, Smart DNR™ and WDR for quality video in challenging lighting environments. The weather resistant housing is easy to install and will Cold Start at -40º F/-40º C.
5 Megapixel MEGApix® PANO 360° View Outdoor Fisheye Cameras with IR can monitor an entire area with a single camera, providing the ultimate ROI. The 1.55mm fisheye lens provides edge-to-edge image clarity. The 5MP sensor produces real-time 30fps panoramic images in an IP66 vandal resistant discrete housing. 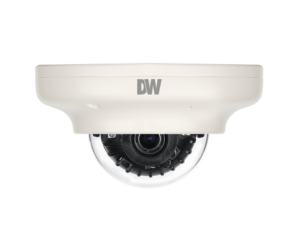 The camera is optimized for use with DW Spectrum™ IPVMS for easy dewarping to 360°, 180° and 90° views with the click of the mouse. This MEGApix® IP camera provides 4 megapixel resolution at up to realtime 30fps. The IP66-rated turret camera housing features a 360° camera gimbal for absolute view adjustment of the camera’s auto focus lens. All MEGApix® cameras are ONVIF conformant, assuring their successful integration with any open platform solution on the market. 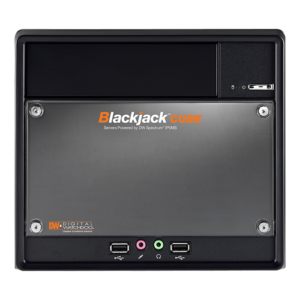 The Blackjack® CUBE-LX can record and manage single-sensor IP cameras of any resolution, with an equivalent capacity of up to 16 2.1MP cameras at 30fps and a maximum of 80Mbps throughput. The hardware includes DVI-D/DVI-I outputs, Linux Ubuntu OS, and Dual Network Card. 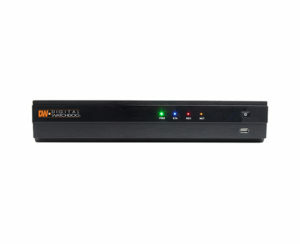 The NVR is ONVIF conformant and is available with 2-18TB HDD and 5 Year Limited Warranty. The VMAX® IP Plus™ is an easy to use to use PoE NVR that allows you to go from power up to monitoring in less than three minutes! The NVR offers unique features such as CCIP™ camera encryption and internal systems diagnostics, keeping your system healthy, secure and up to date. 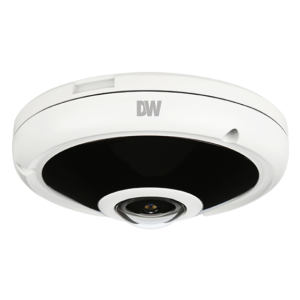 Combine with the DW Witness™ app to turn the camera on a smartphone or tablet into a surveillance camera that can be viewed and recorded on the NVR. Available with 16 PoE ports, the NVRs can record and manage single-sensor IP cameras up to 5 Megapixel, with 80Mbps maximum throughput.